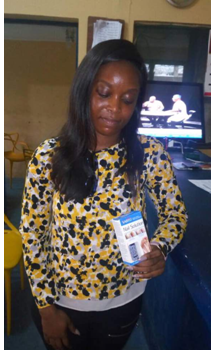 a Lagos Magistrate Court for allegedly stealing one Varisinail solution valued at 10,000 at Prine Ebeano Supermarkets Located on Admiralty road, Lekki Phase 1, Lekki, Lagos. The accused, a residence of Idado Estate, Lagos was arrested by the police at Mobolaji Johnson Police post, Lekki and arraigned before an Igbosere Magistrate Court on a one count charge of stealing. Police prosecutor, Chinedu Njoku informed the court in charge No. B/59/2017 that the accused committed the alleged offence on 8 September, 2017 at Prince Ebeano Supermarket, Lekki. Njoku told the court that the accused walk into the supermarkets with the pretence of buying something and that in the process, she allegedly stole one Varisi Nail Solution valued at 10,000 and hid it inside her bag unknown to her that the CCTV cameras mounted inside the supermarket had captured her. He said that nemesis, however, caught up with the accused when she attempted to leave the supermarket through the exit gate while the security men on duty stopped her for a search and allegedly found the stolen item inside her bag. Njoku said that the offence the accused committed was punishable under section 287 of the criminal of Lagos State 2016. The accused pleaded not guilty to the alleged crime in the open court and Chief Magistrate Folashade Botoku granted her bail in the sum of N10,000 with one surety in like sum. Botoku adjourned the case till 26 September, 2017. That's pathetic.. What a shame..